Sergio Oliveira was instrumental in Pacos de Ferreira’s win over league-leaders Benfica. This weekend’s action in the Primeira Liga was exciting and unpredictable. Title-challengers Porto and Benfica lost to Maritimo and Pacos Ferreira, respectively, while Sporting CP closed the gap with a win over Academica. Let’s take a look at the rest of the action. The action kicked off on Saturday as over-performing Vitoria Guimaraes hosted under-performing Gil Vicente. Gil Vicente went into this game at bottom of the table, while Guimaraes sat at an impressive fourth in the table. With Gil Vicente’s chances of survival looking grim at this point, they predictably began the game with attacking intent, and were greatly rewarded. Simeon Nwankwo scored first for Vicente, before a second half goal from former Sporting and Braga left-back Evaldo doubled the team’s advantage. A late comeback from Guimaraes earned them a point, however, with Ricardo Valente scoring his second goal for the club and Andre Andre scoring a late penalty. On Sunday, Vitoria Setubal hosted Rio Ave. If this match had been played earlier in the season, the outcome would have been predictable, but both teams’ fortunes have changed drastically in recent weeks. Following the sacking of Domingos Paciencia following poor results, Vitoria Setubal has thrived under new manager Bruno Ribeiro. After going behind early in the game thanks to a goal from Rio Ave’s Ukra, Vitoria Setubal scored four unanswered goals. Suk, Zequinha, Pelkas, and Joao Schmidt all scored for Setubal, as they ran away with an impressive and vital 4-1 victory. Elsewhere, Belenenses were unable to build on an impressive victory over Sporting in the Taca da Liga midweek, as they only mustered a 0-0 draw against Penafiel. Later in the day, Moreirense hosted Nacional. Both teams have been performing well of late, and the match was a predictably close affair. Moreirense struck first through Rodrigo Battaglia, before Nacional’s Marco Matias equalized just after the half. Moreirense took the lead again through Gerso, but two late goals from Rondon and Lucas Joao earned Nacional a 3-2 victory. Elswhere, Sporting narrowly defeated Academica 1-0 after a second-half header from Joao Mario. It was a tense, but entertaining encounter, and although the scoreline suggests a close encounter, Sporting were firmly in control of the match. This win pushes them closer to the top of the league. In a closer encounter, Estoril edged Arouca, who are beginning to slip down the table following some lackluster results. Estoril’s Leo Bonatini grabbed the only goal of the game. In a decisive encounter, Maritimo hosted Porto, and revenge was on the cards. On the first matchday, Porto defeated Maritimo 2-0. This time out, however, Maritimo claimed a potentially momentous 1-0 victory, handing Porto their first loss in the league since the middle of December. Bruno Gallo’s first-half volley put Maritimo ahead, and the Madeirans were able to hold on for the full 90 minutes. In Saturday’s final match, Boavista hosted a resurgent Braga side. This match was also a case of revenge, as Braga defeated Boavista 3-0 in the first matchday of the season. This time out, Boavista claimed an impressive 1-0 victory, thanks to a second-half goal from Uchebo. This win saw Boavista consolidate their mid-table position, and saw Braga lose traction in their push for a Champions League place. 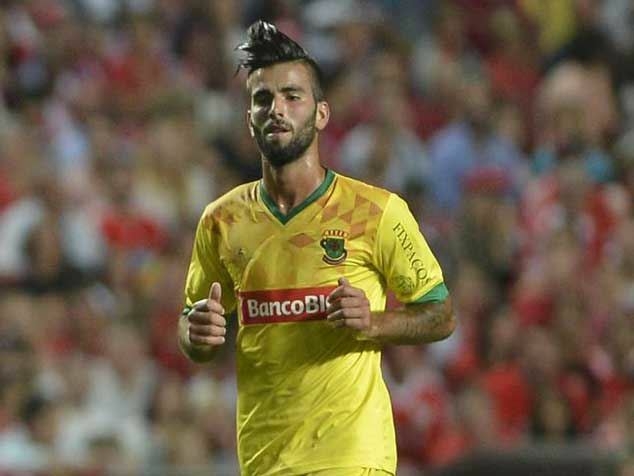 On Sunday, Pacos Ferreira defeated Benfica 1-0 in a tightly-contested affair. Benfica are favorites for the title this season, despite losing key players over the summer. The additions of Anderson Talisca and Jonas have greatly helped the team, which currently sits atop the table. Despite having the better chances throughout the match, Benfica were unable to gain any advantage against Pacos. In stoppage time at the end of the match, Eliseu brought down a Pacos player in the box. The referee awarded a penalty, which Sergio Oliveira dispatched calmly, giving Pacos a priceless victory.